After three long drizzly mizzly days we have at last got a bit of a respite. 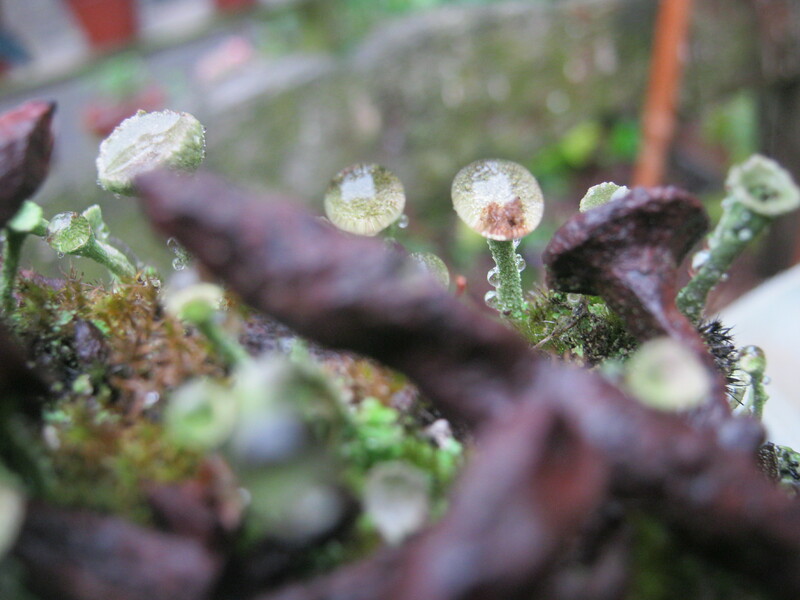 In between the showers I did manage to capture some tiny highlights. Cotinus ‘Notcutt’s’ variety. 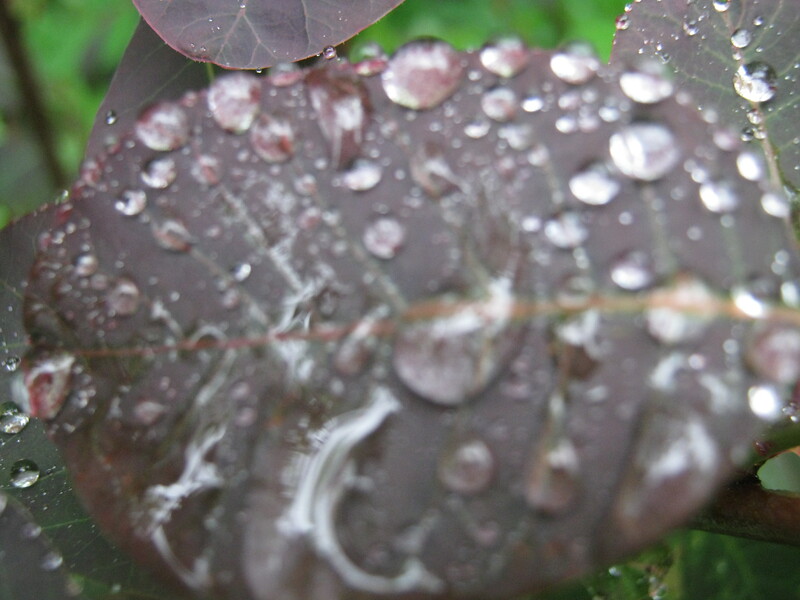 More rain than leaf. 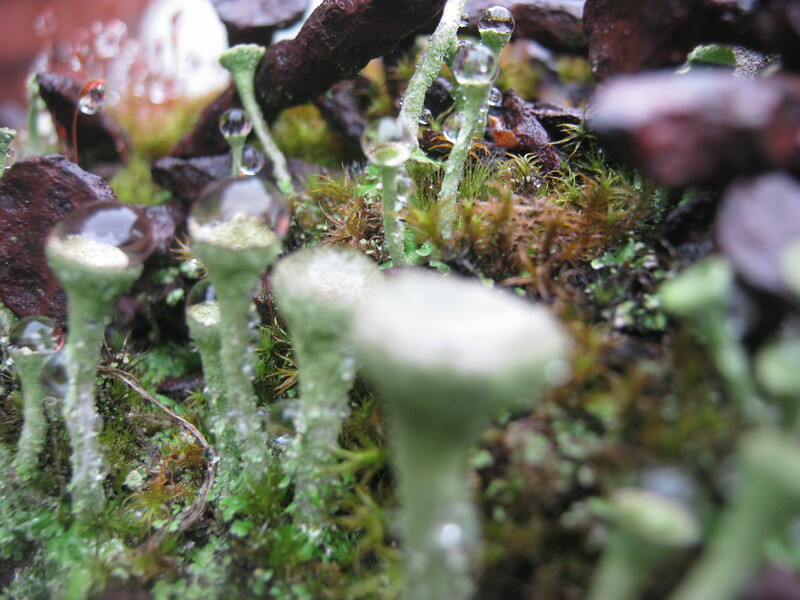 …….even the Cup Lichen looks like Crystal Balls…..
…and all the while Imogen is saying ‘can I blow them away now.’…. ……the girls favourite plant Stipa Tenuifolia ….might be common, but it’s safe in a large pot, sat in an old chimney where the girls spend ages plaiting and brushing it’s ‘hair’. 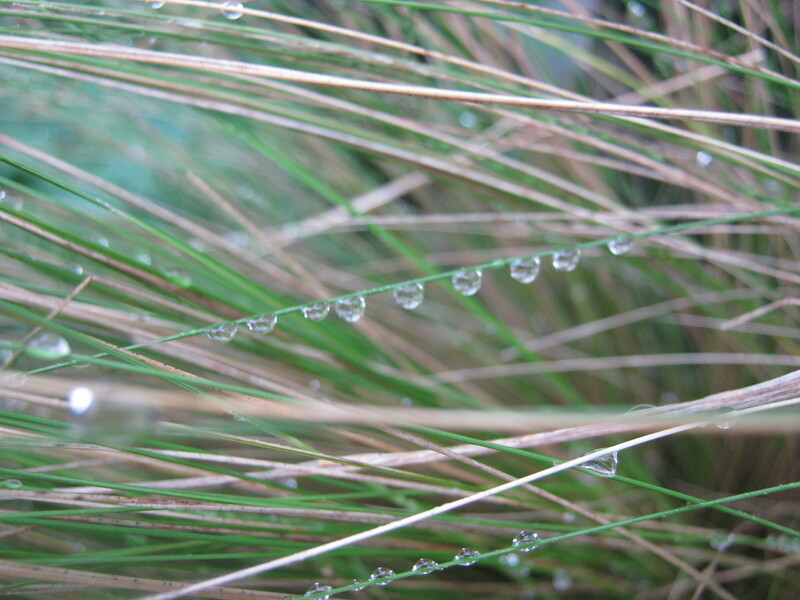 Rain drops looking more like diamonds. Everything seems to be coming all at once. Not that I am complaining far from it, the whole area is so lush. 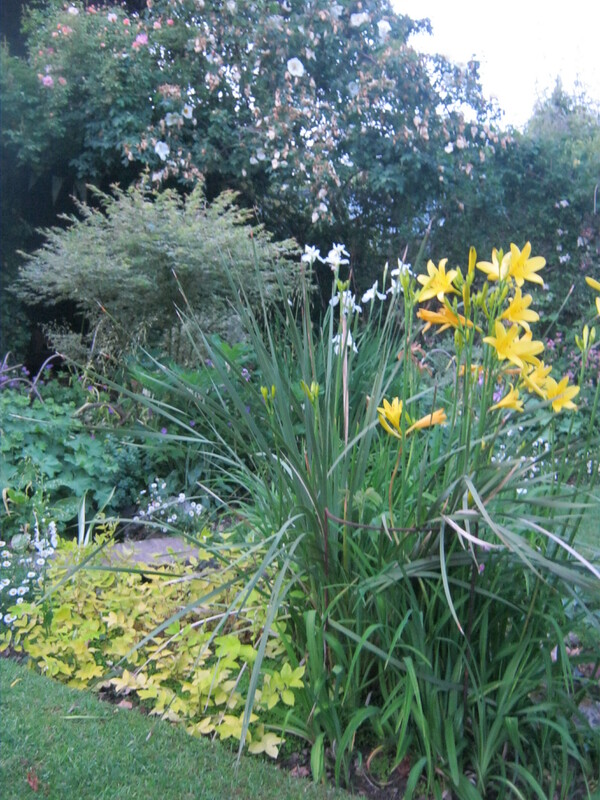 One job I must get on with is getting rid of the spring bulb leaves then that will give me more space for hardy annuals. 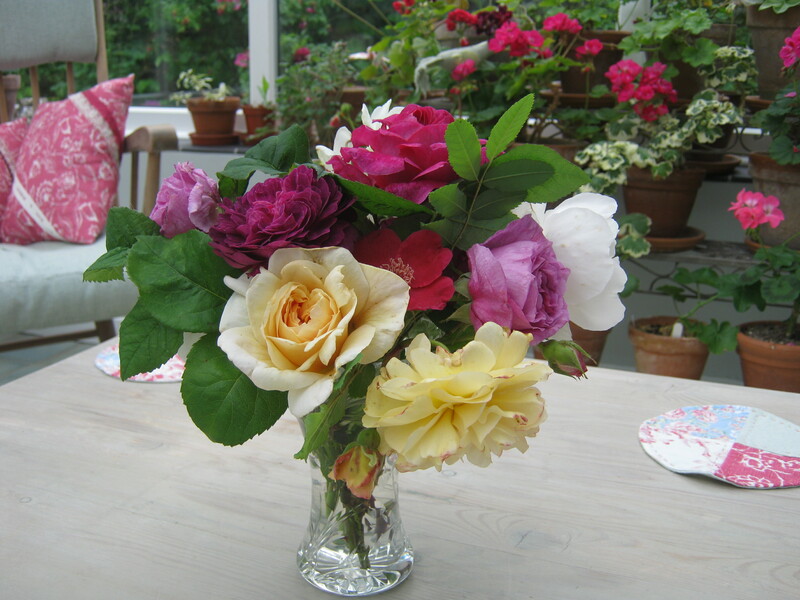 The roses have started to flower quite early this year, this is a selection of just a few. 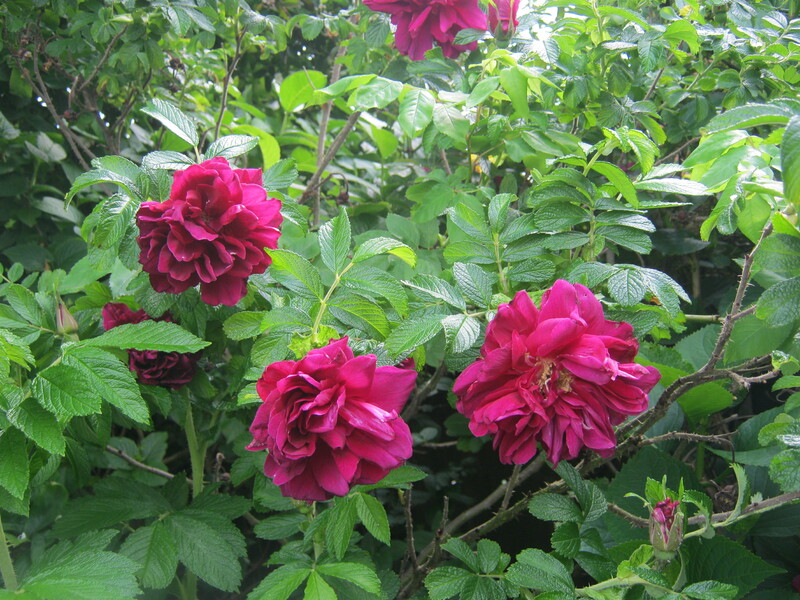 Maybe this rose is now seen too much in council hedging schemes, but I think it is a sumptuous rose. Flowering all summer long, the foliage is always healthy, the blooms when not weather beaten are perfect and the perfume is strong. Need I say more. 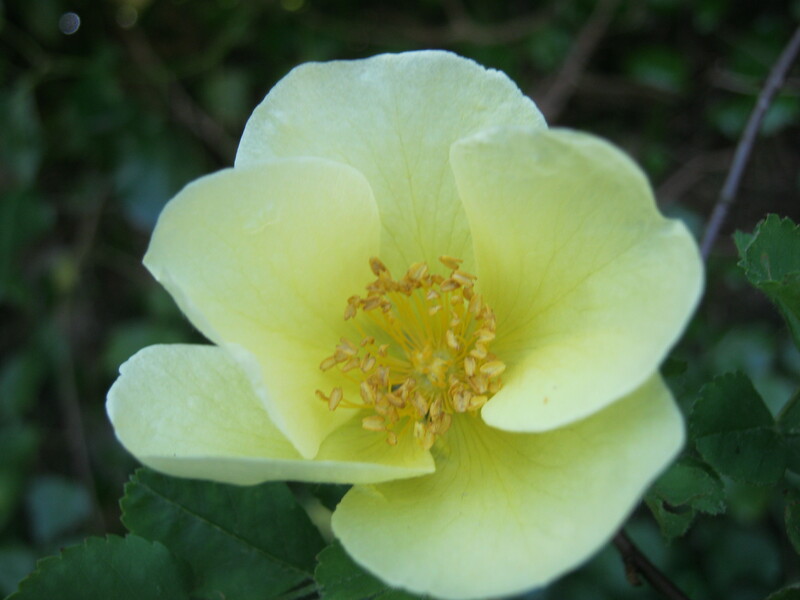 The very last bloom on this early rose, always a welcome sight in the spring. Grown from a cutting taken from a garden belonging to an old lady back in the 1990’s. She was going to move to a smaller house so took me around her garden and gave me cutting after cutting of many beautiful roses. 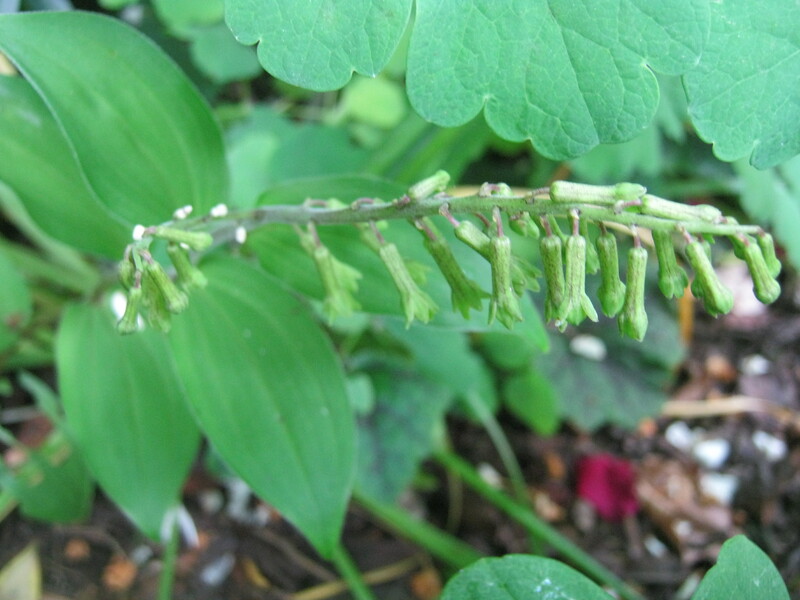 So many of them struck and my garden has benefited from this wonderful gift. Nevada is on a low trellis screening the White Garden from the greenhouse. 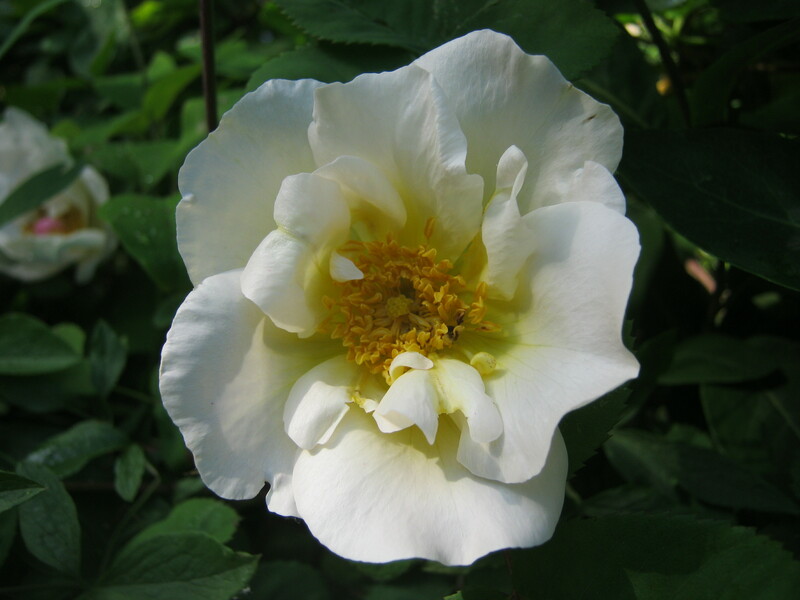 As it is a once flowering rose with only perhaps a few solitary flowers later on, I grow it along side Clematis viticella Alba Luxurians and Akebia Quinata. I always say where you can grow one climber you can grow three (or more ). 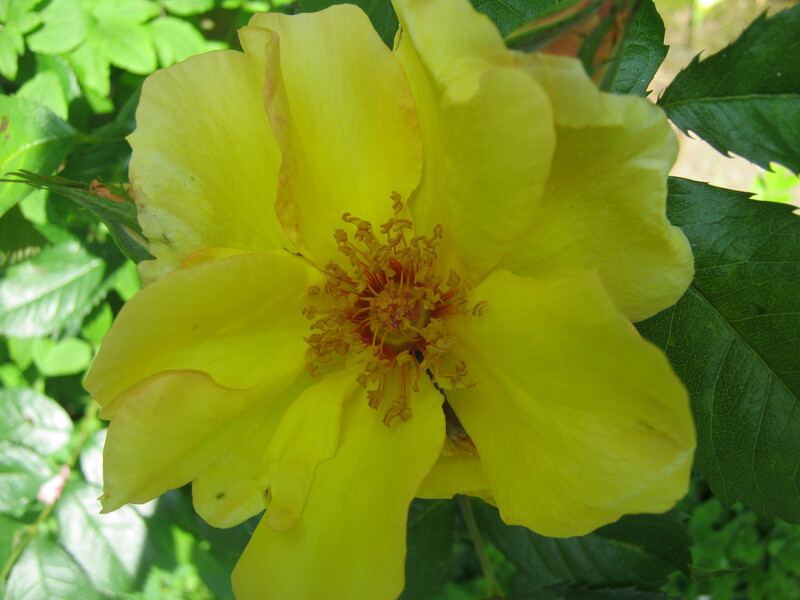 Another old shrub rose with superb flagon shaped hips. Bought from David Austin Roses about 25 years ago. 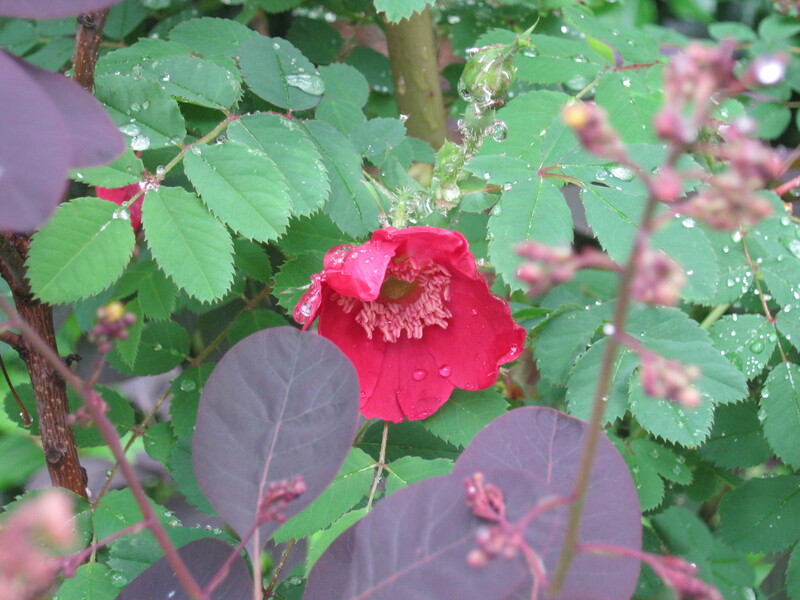 This grows in amongst Cotinus ‘Notcutt’s Variety’, the foliage complimenting the colour of the rose well. A modern climber, Golden Showers very apt as I have just run the gauntlet in the pouring rain to go and find it’s name. 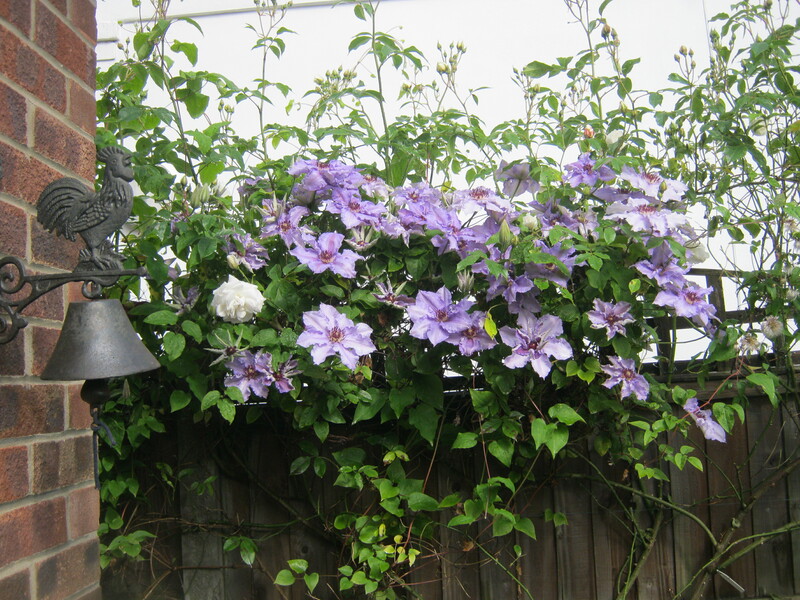 A good general climbing rose grown on a pillar along side a viticella clematis with small purple hanging bells. This clematis seeds about quite a bit but that can only be a bonus. Well the beginnings of, but what a clematis !! No idea which it is but it’s stunning, just hope the flowers last long enough for me to see it flower among the rose. 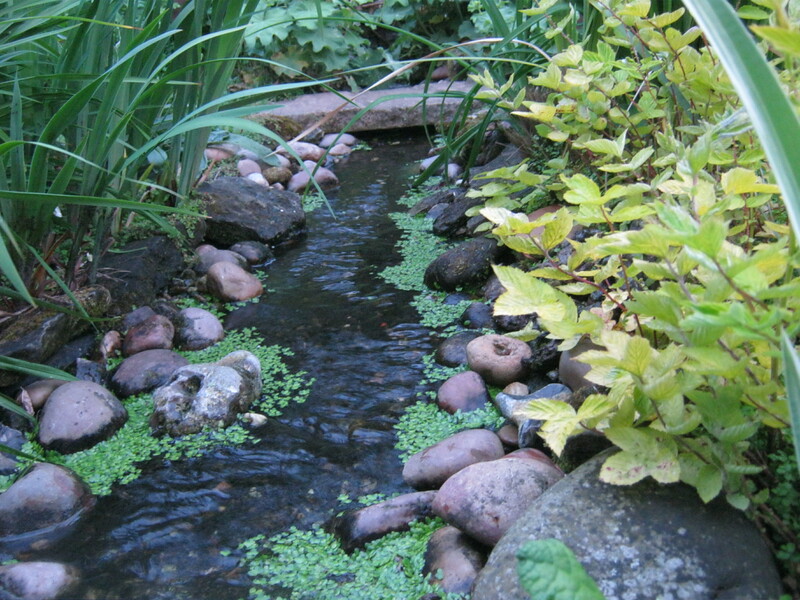 And now for the sublime…. Bought on one of our forays to North Wales and Crug Farm Plants. 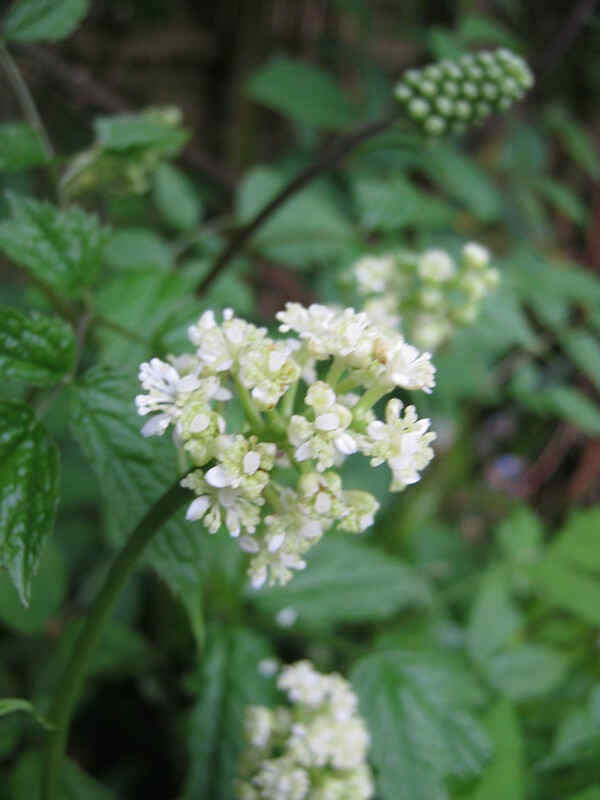 A tiny flower, scented if you can get down that far, followed by fleshy red fruits. 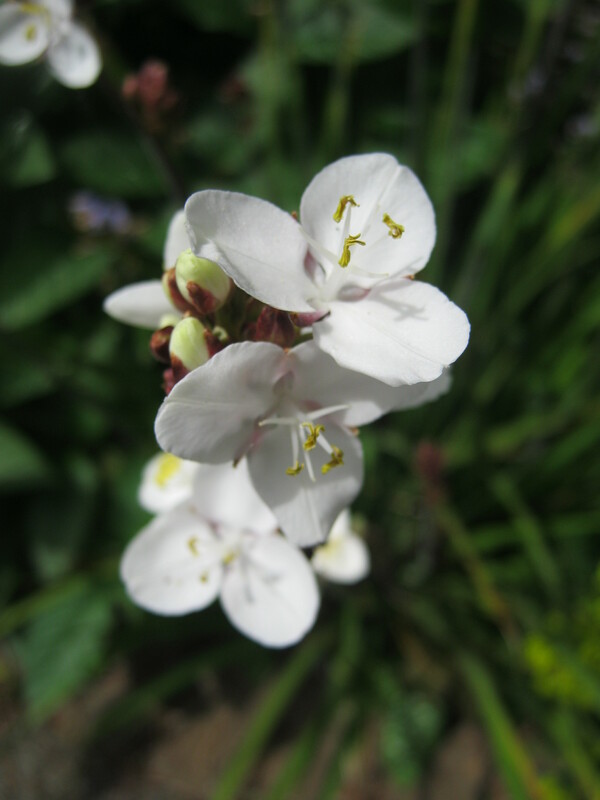 This is a woodland plant grown by Sue and Bleddyn Wynn Jones, from seed that they have collected from around the world. 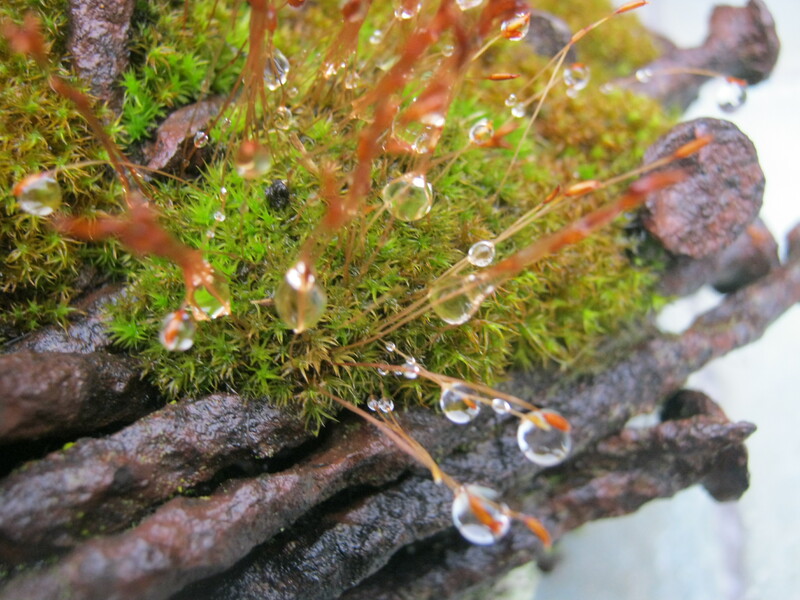 If you have been following Chelsea then you will have seen the exhibit inspired by Wardian Cases, well all the plants in that display came from Crug. 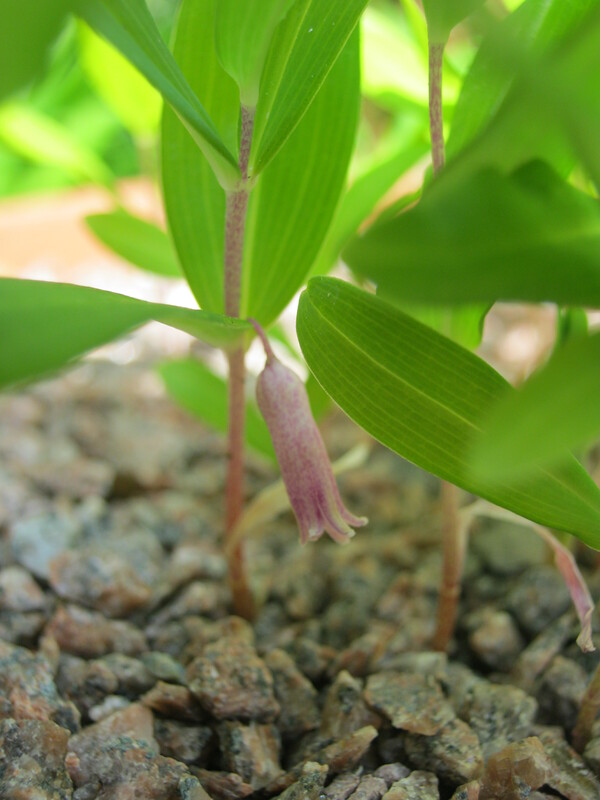 A tiny polygonatum growing to only20 cms, having tiny pinky/purple flowers. 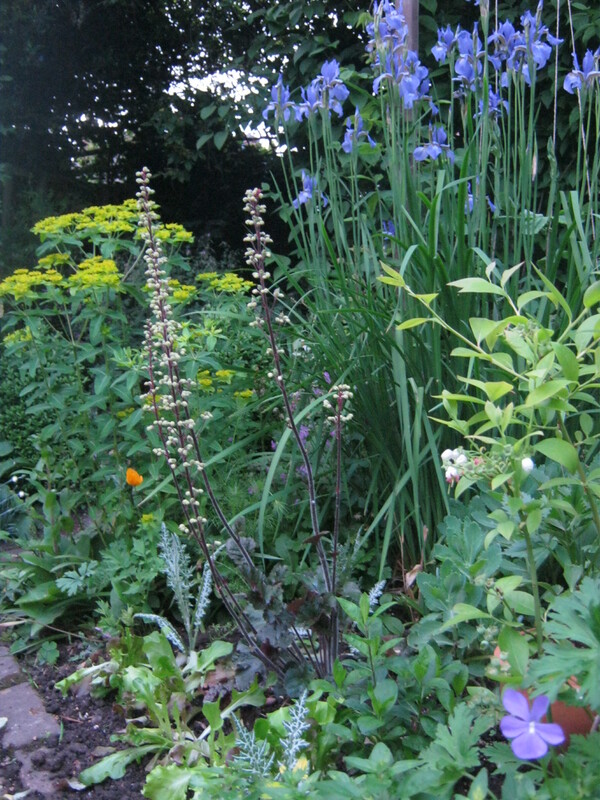 This would grow in a well drained front of the border, but I don’t think you would see the lovely little flowers. I have had mine in a pot since 2001 and only increased the size of the pot twice. This plant along with many others came from Kevin Pratt at Poppy Heads Ltd. I don’t think that the nursery exists anymore as I cannot find it on line, but I do know that he did gives/gave talks to groups. So if anyone knows if he still sells plants I would love to know. So I have taken you from some of the big and blousey to the small diminutive flowers that are blooming at the moment in my garden. There will be many more to come …I hope you enjoy the journey. 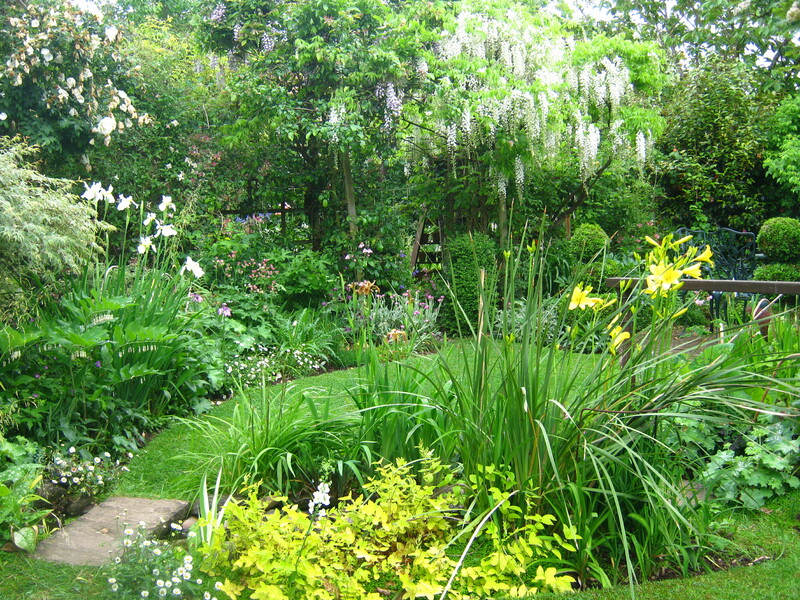 Many years ago I went on a local Garden Trail, it was in the oldest private estate in Nottingham called ‘The Park Estate’. Several of the houses were designed and built by Watson Fothergill a famous Victorian architect who also designed many of the old buildings that remain in the city. I digress, so while looking at yet more bedding schemes and getting a little bored with some of the gardens, we finally entered an amazing garden which was not all neat and tidy. 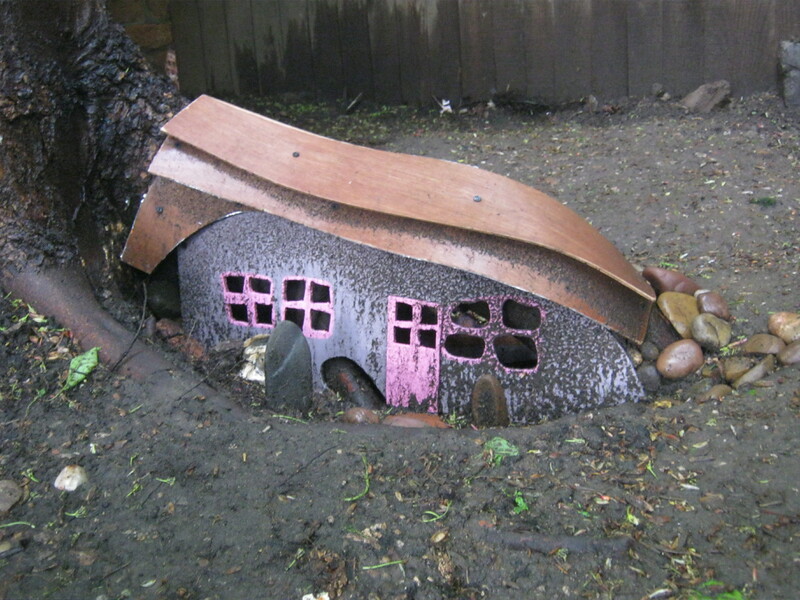 No one had ‘designed’ it, it was one woman’s idea of a garden. Well I was smitten. 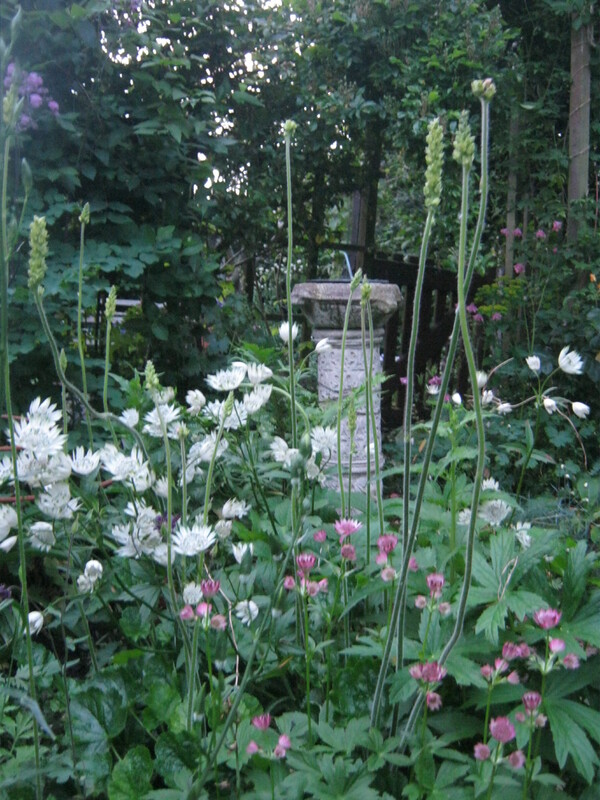 The whole garden rose up a steep stepped slope, and everywhere you looked it was shades and tones of white and green. The garden was also quite shady as a lot of the trees on this estate are protected. But that had not put her off. I was so taken with this limited palette of colours that I made a pact with myself to try to emulate just a part of the fantastic display. 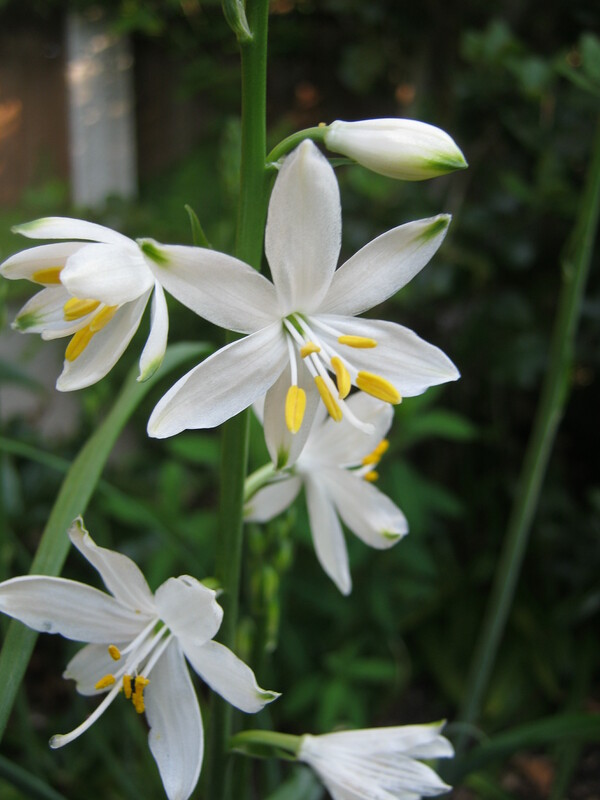 Another similar looking plant but with star shape flowers showing prominant stamens. Dolls eyes, because the white berries have a black spot reminiscent of the button eyes you found in soft toys and dolls of ‘yesteryear’. 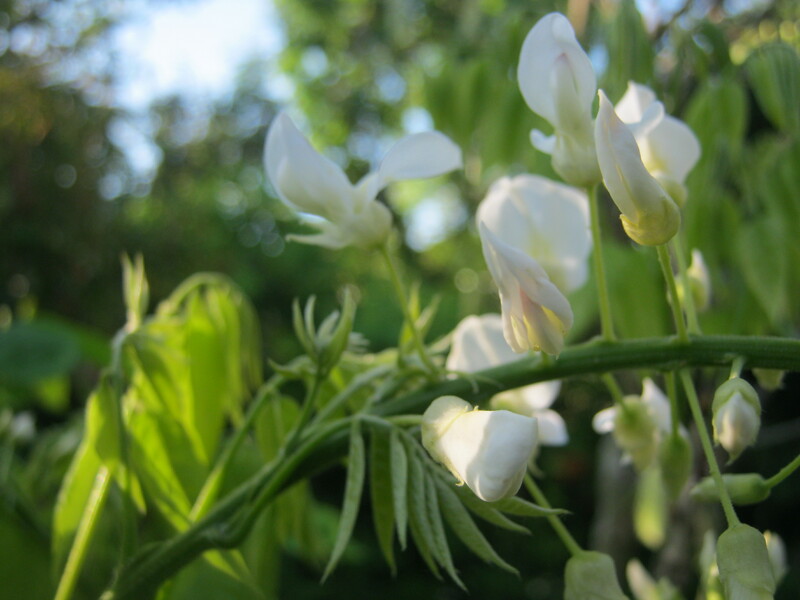 The white Wisteria* is showing colour a good three weeks earlier than last year. Mespilus Germanica ‘Nottingham’*, a beautiful medium sized medlar and one I shall never forget the name of. 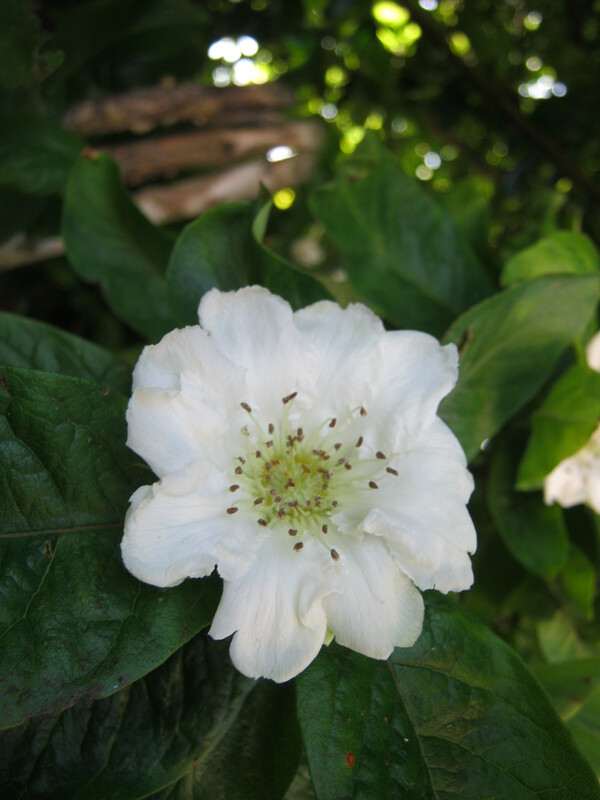 When I was at college we had ‘plant identification’ every week and in the large gardens a medlar grew. I was intrigued by this tree and my tutor gave me all the information I wanted, but never let me forget it’s name, he would ask me every week ‘What’s the name of that tree ?’….so it stuck…. 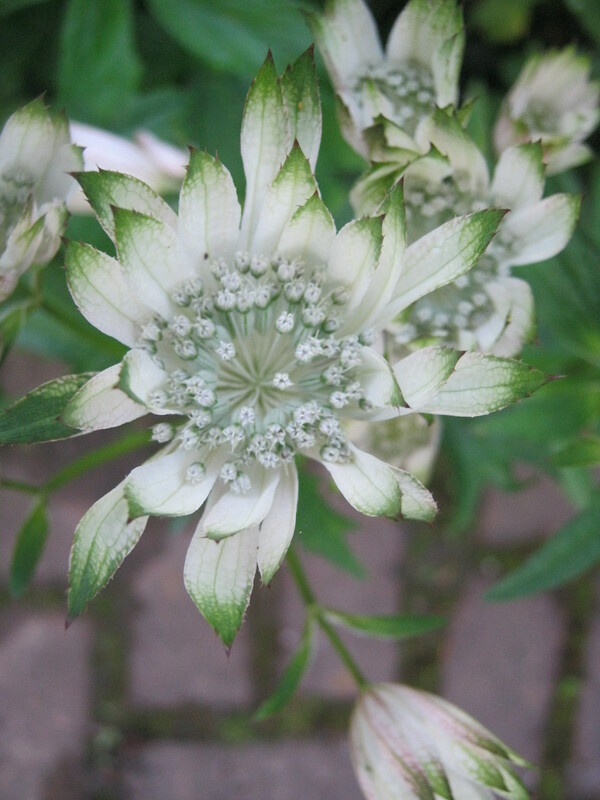 Astrantia ‘Shaggy’ just showing it’s first flowers. A huge flower and one that seeds nicely around the garden giving me several each year for plant sales. 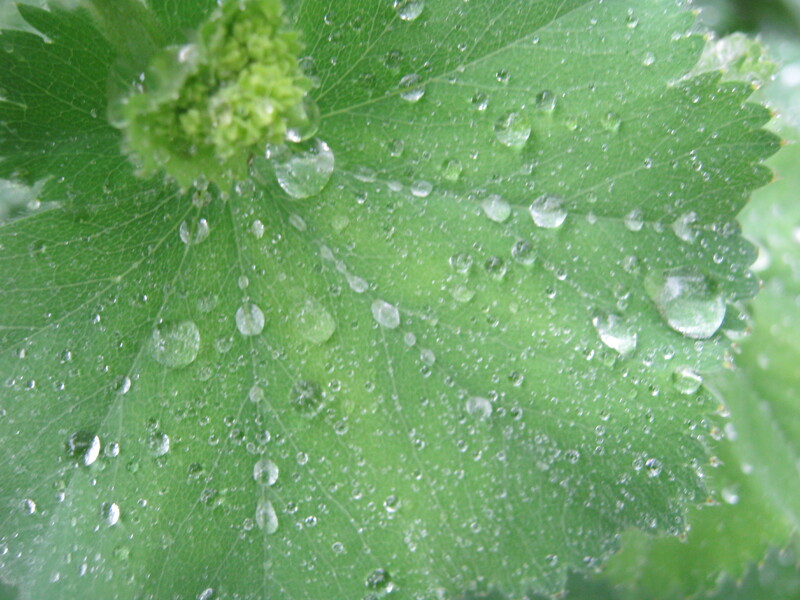 Aquilegia. 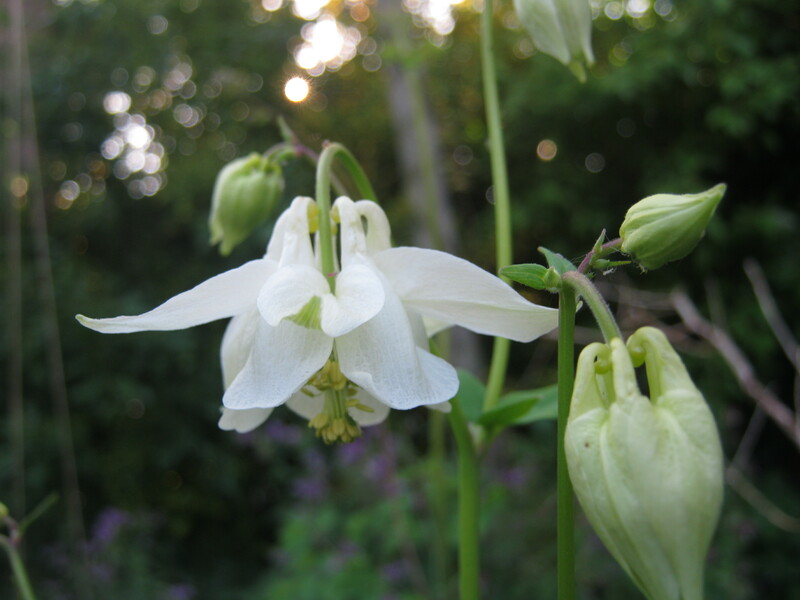 As you all know Aquilegia are really promiscuous popping up anywhere in all sorts of colours and forms. I never tire of them and rarely discard any. So when I get a good white one it is moved eventually to the White Garden. 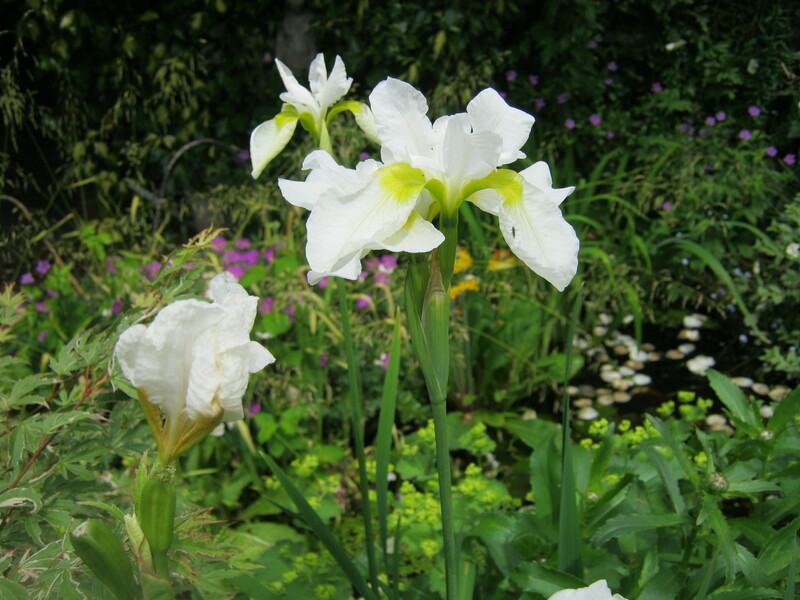 Iris sibirica ‘Wisley White’* a really delicate iris forming a nice sized clump this is at the side of the pond, looking quite graceful. So although I do have a very small ‘White Garden’ this doesn’t put me off trying to keep to a colour scheme. I try not to overdo this and use lots of different shades of green along with different textures. 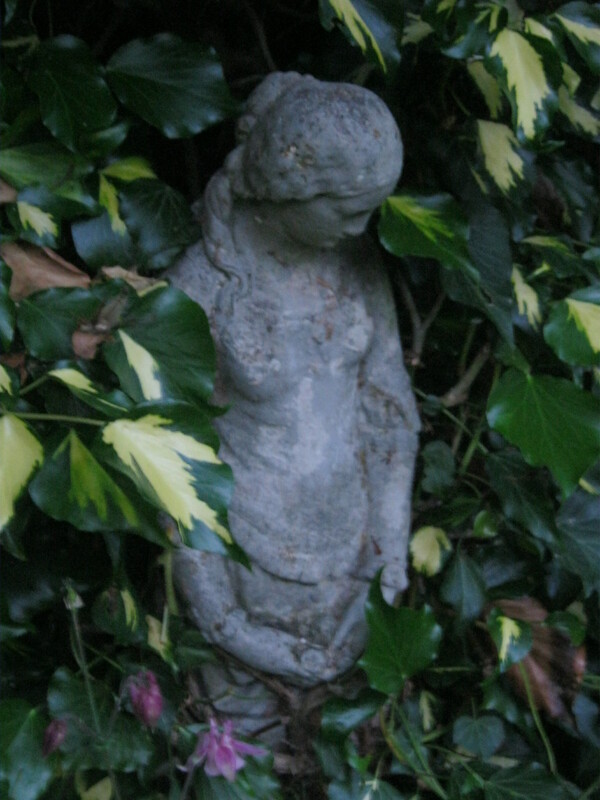 It is an on going part of my garden one that is constantly being reworked. The area faces south but I have a damp shady area there as well. 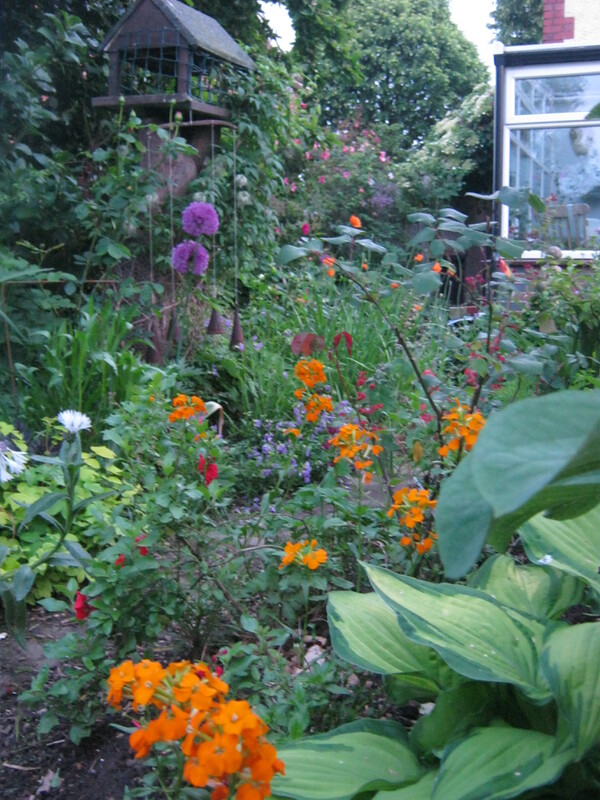 Not all the plants I have picture are in this area but they do play an important role in the overall look of my garden. * These plants are not in the White Garden.